If you ever have the pleasure of hosting Bishop William McGrattan for supper, plan to serve pasta, brush up on your politics and history, and have the film A Man For All Seasons in your collection. You can expect His Excellency to be an equally proficient conversationalist and listener. Oh, and fair warning: if there’s a hockey game on, he might be cheering for the Boston Bruins (more on that in his profile). This is just some of what I discovered in my meeting with the man behind the lofty title. 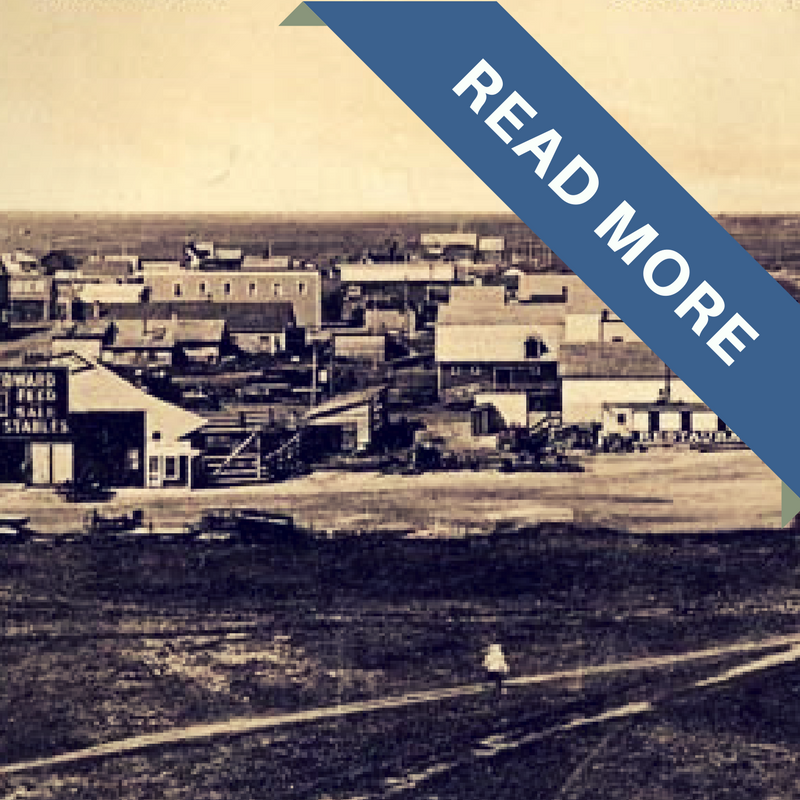 I had been going about my day, cooking meals, folding laundry, and changing diapers when out of the blue, I received a request from the bishop’s office to interview the bishop about his first year in Calgary. Life with four young children is busy. So busy, in fact, that I haven’t had time to do much writing lately. So when I sat down to ask the Bishop to describe his first year in a word, and he said “Busy,” I felt that we were somehow already on the same page. And so the two of us, both living out our different (yet equally important) vocations, set about our conversation. Our conversation felt so natural that I even ditched my notes; everything just seemed to flow. His warm, humble presence created a comfortable, inviting atmosphere. It almost felt like a chat with an old friend, catching up on life. Looking around his office, I noted two large bookshelves filled with a diverse assortment of books. 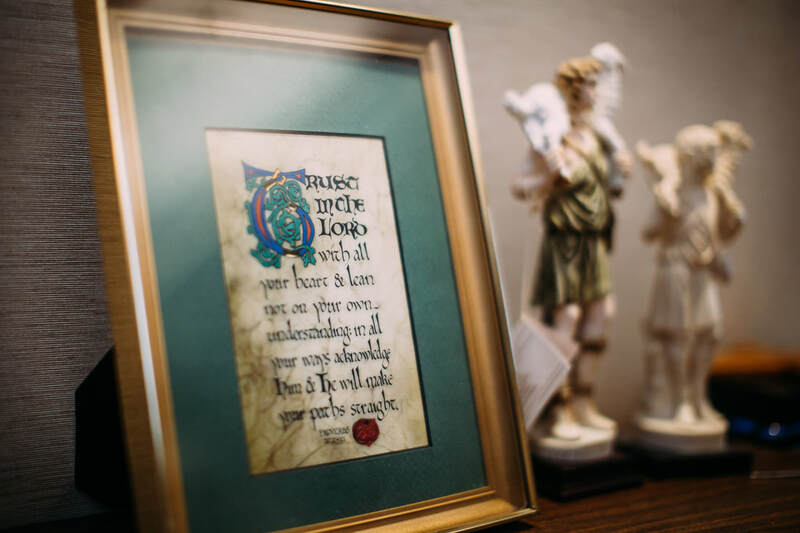 Religious paintings and statues adorned the walls; each one received as a gift, which he said helps to fill his (modern but otherwise typical) office space with beauty. It is this trust in the Lord that has led him away from the familiarity of his home province of Ontario on an adventure out West to Alberta. 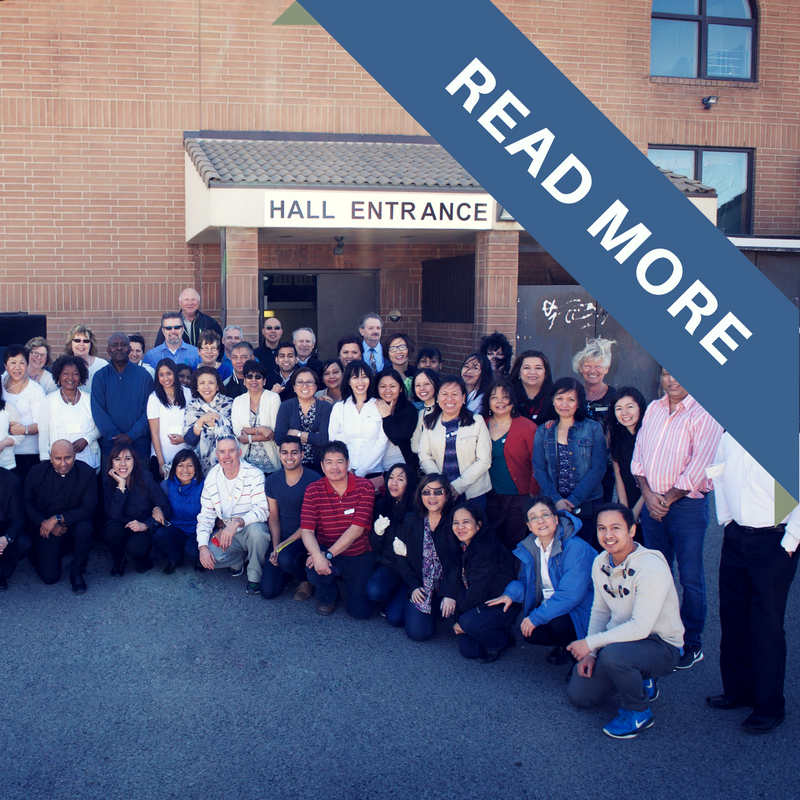 He has spent much of his first year on the move, visiting the diverse people and places that comprise the Diocese of Calgary. It’s nothing new for McGrattan, who has been in motion for the last seven years, with three different jobs as Auxiliary Bishop of Toronto, Bishop of Peterborough and now, Bishop of Calgary. However, it’s clear that whatever his path, he is guided by obedience to his call and his love of God. Written by Sara Francis. Sara is a writer living in Calgary with her husband Ben and their four children. They attend St. Bernard's / Our Lady of the Assumption Parish. Photo by Lindsay Milner. The Bishop's motto. Photo by Ben Francis. At the end of our second meeting, I followed standard journalistic practice and asked if there was anything else he would like to add that may have been missed. “No, I don’t think so. I trust you,” he said. After two separate hour-long interviews, I really felt like, in fact, a mutual trust and respect had been reached. We walked down to the lobby together, both on our way back to our respective duties, he wished me God’s blessings in my vocation, and I echoed the sentiment back to him. On my way home, I reflected that with Bishop McGrattan at the helm, I feel excited for the future of our diocese and also for my own future as a disciple of Christ. In the quiet of a small parish on the Tsuut'ina Nation, about 20 people sat waiting for Mass to begin. Through the eyes of Bishop William McGrattan, these parishioners appeared peaceful, contemplative and recollected in one another’s presence. Since moving to Calgary, McGrattan has visited many parishes and met thousands of people, but what most struck him was the sense of community at the sign of peace, and the profound reverence with which these parishioners prepared to receive the Eucharist because of their reverence for one another. “I was expecting something like the celebrations in some of our urban and rural parishes,” said McGrattan. ​This intimate look at parish life characterizes much of McGrattan’s first year in Calgary. He is a bishop who prioritizes pastoral relationship. And he wants one with each of us. He takes his role as shepherd seriously, but knowing he cannot singlehandedly meet the needs of each of his 400,000 sheep, he is strengthening his relationship with his priests so they can strengthen relationships with their parishioners. But it doesn’t stop there. He thinks big. He wants to build relationships between parishes, and even other dioceses across Canada. So to start, he’s spent this last year building relationships one meeting at a time. ​His approach is influenced by Pope John Paul II’s spirituality of communion, described in his apostolic letter, Novo Millennio Ineunte. It encourages dialogue between pastors and faithful, recognizing the gifts of each and appreciating the value each person adds to the Church. McGrattan has appreciated the friendship and support of retired Bishop Fred Henry during this year of transition. Out of fraternal support, Henry has offered to make himself available only when asked, and McGrattan has indeed sought his wisdom. McGrattan has brought his gifts as former rector of St. Peter’s Seminary for 12 years to Calgary by delegating roles of leadership to empower his priests. There are now priestly vicars overseeing lay associations, religious communities, permanent deacons, education and international priests. “The importance of delegation is not just to get work done, but to receive support, to receive input and ideas. Delegation isn’t just one way,” said McGrattan. ​​McGrattan has also spent a lot of time meeting parish communities across the diocese. He’s made nine pastoral visits to parishes’ and the schools, nursing homes and hospitals they serve. These are three-day visits where he celebrates Mass and gets to know the parish by speaking with everyone from altar servers to Knights of Columbus members; administrative staff to clergy. This has been his practice since he was first ordained a bishop in 2010. Since then, he’s made 68 pastoral visits. His goal is to continue making 10 per year. In Calgary, he’s visited St. Mary’s Cathedral, Holy Spirit, St. Michael’s and St. James. Outside Calgary he’s visited Lethbridge, Chestermere, Strathmore, Okotoks and Drumheller. He goes to Airdrie in June. He’s made a number of observations during his visits. 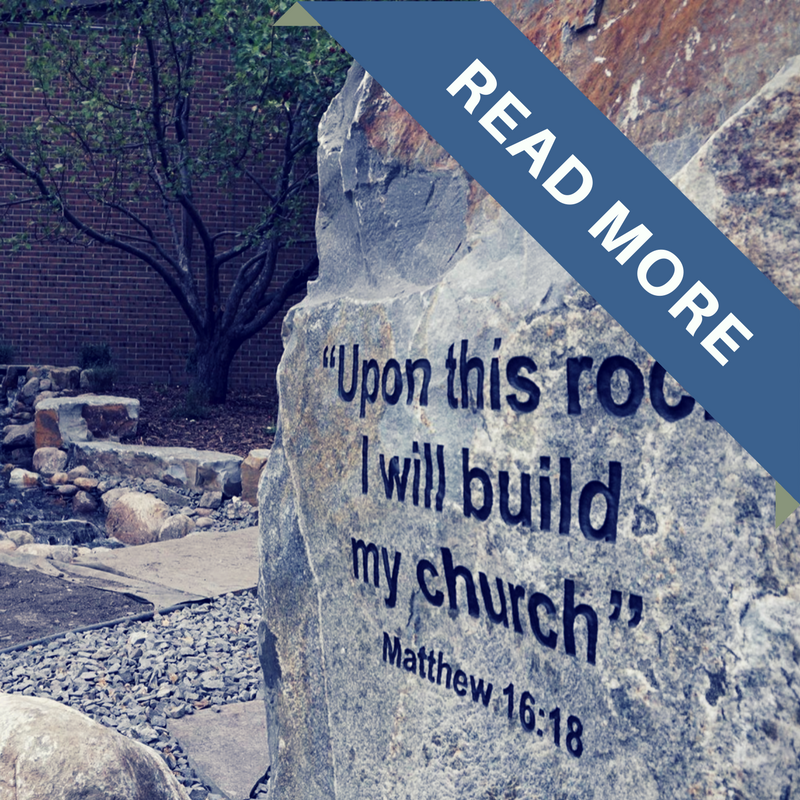 Shifting Gears & Growing: The Renovation project of Ascension Catholic Church, Calgary. 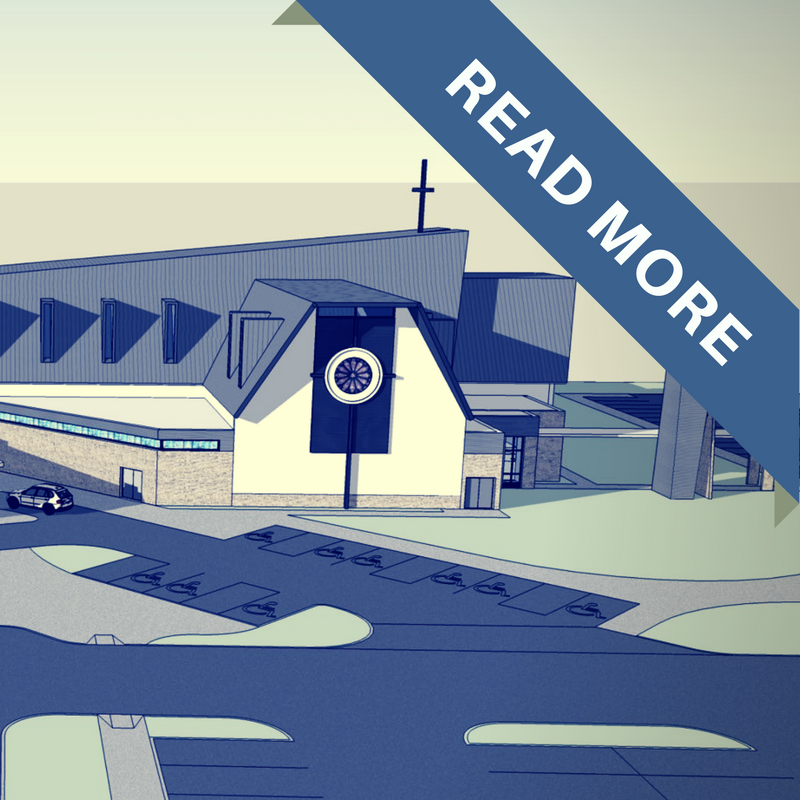 Transforming A Grocery Store Into A Church: Sacred Heart Parish in Strathmore. 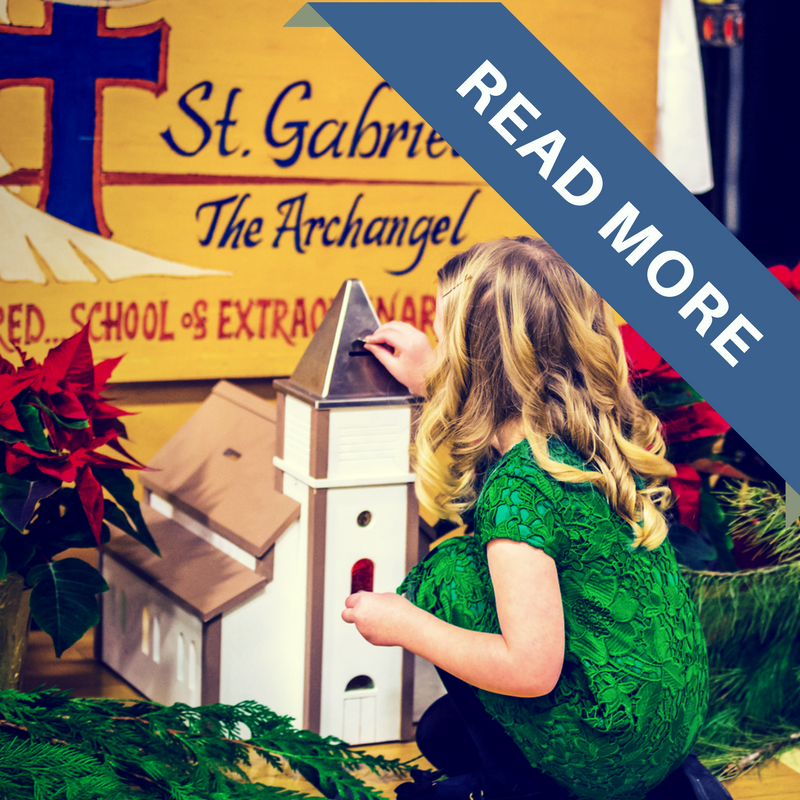 From A Summer Village to A City: Building the St. Gabriel The Archangel Church in Chestermere. 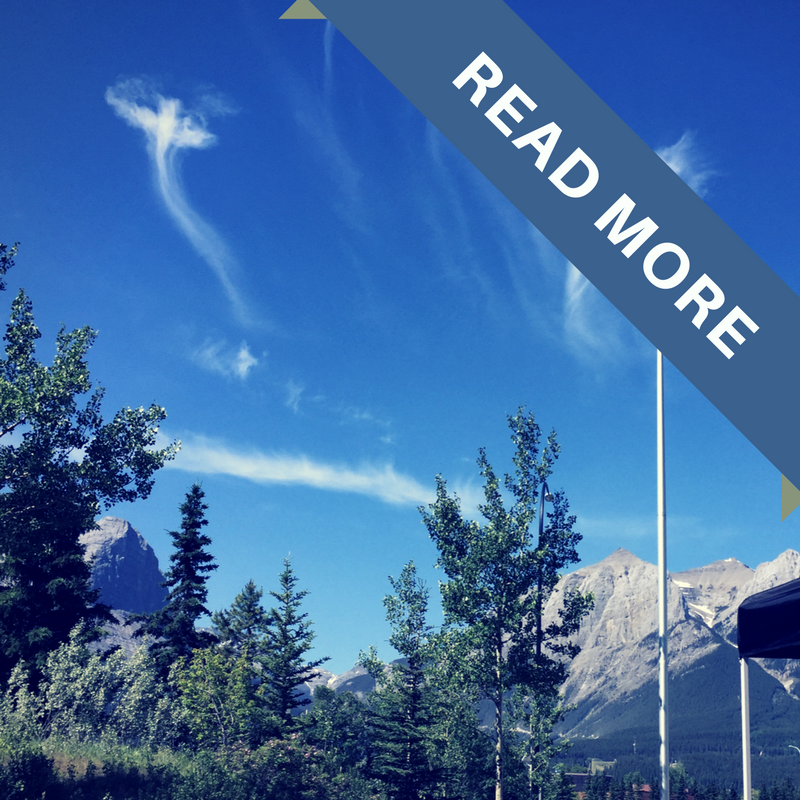 Click to learn more about the upcoming Curia updates in the Diocese of Calgary. Parishioners desire to know more about their faith through increased formation and catechesis. Parishes have developed creative outreach ministries for people who need accompaniment such as seniors and widowers. Parishes are spiritually proactive with prayer and Bible groups. More parishes need to network with one another to share knowledge and resources. The percentage of families in the Catholic school system who attend Mass is low. 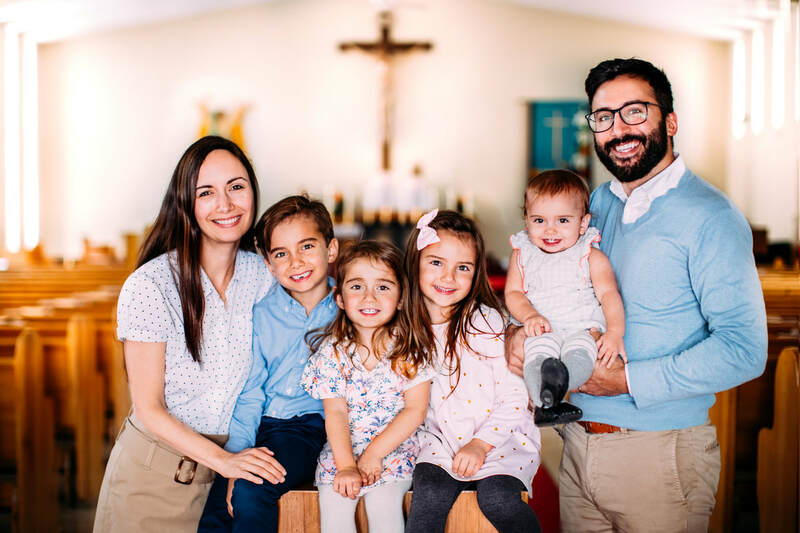 Many have voiced, being present in the schools and sacramental preparation as one way to strengthen the relationship between the school and the parish. More planning from the Catholic Pastoral Centre for the future is needed to strengthen parish life. 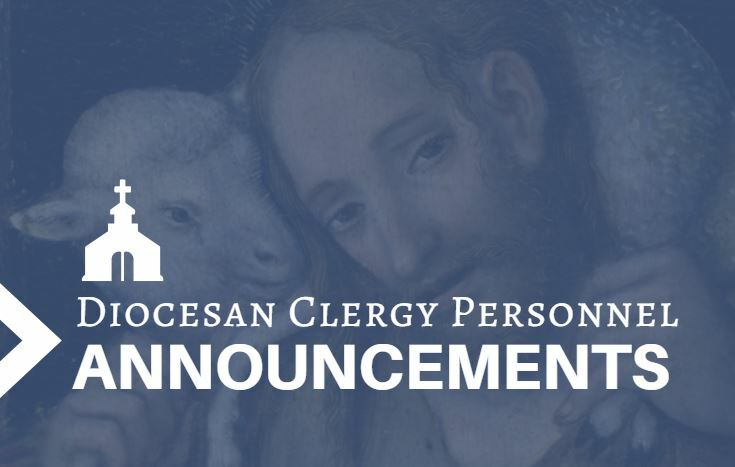 ​​​A pastoral plan process for the diocese is in the works, and this will support the collaborative development of a new Pastoral Plan for the Diocese in the next two to three years. 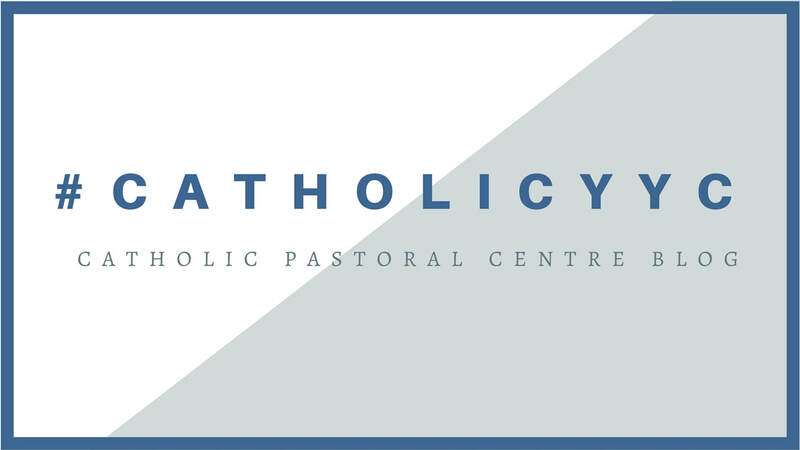 Currently, McGrattan is focused on planning for the future of the Catholic Pastoral Centre. He wants it to better serve the parishes, as part of a bigger plan to form and empower missionary disciples. A sheet of ice, a pair of skates, a stick, and a puck. These are tools that God used to build a young Ontario boy of Irish-German descent into the man he is today: the 8th bishop of the Diocese of Calgary. “Growing up, I loved the winter because we had a hockey rink in the backyard and it was shared with our neighbours, so it was a huge rink,” said Bishop William Terrence McGrattan. In order to play hockey before school with his classmates at St. George’s Public School rink, his father suggested he might consider going to morning Mass first. And that’s how hockey hooked him into regularly attending daily Mass as a 10-year-old. “God works with many of our natural experiences to draw us in,” said the 61-year-old London, Ontario native. A sports fan and athlete to this day. He is also a lifelong supporter of the Boston Bruins, who held pre-season training camps in the bishop’s hometown during his youth. The smell of grass clippings and autumn leaves, peanut butter cookies and apple pie are reminders of the home where his faith took root. Known as an excellent baker, the neighbourhood kids would come around for a taste of his mother Mary McGrattan’s homemade goodies. She was a steadfast presence in the home while his father Terrence, a pharmaceutical representative traveled throughout the week. Cutting grass in the summer and raking leaves in the fall are some of the chores his father assigned to instill in him a conscientious work ethic. McGrattan’s diligence continued into his teenage years. In Grade 7, he would set his alarm for 5 a.m., waking to deliver newspapers. Then in Grade 8, he began a house painting company for eight years that would pay his way through high school and university – at that time, Grades 11-13 were not publically funded in Ontario. He was the first in his family to go to university, earning a Bachelor of Engineering Science degree in four years by taking night and summer classes. The 22-year-old began his professional career and worked just three years before entering St. Peter’s Seminary. In his last year of work he wrestled intensely for six months, trying to figure out if he had a priestly vocation. At the main doors of St. Peter's Seminary in London, Ontario. With the guidance of his regular confessor, he came to terms with the idea that God may be asking him to consider the priesthood. “Once I accepted that, there was a lifting of this heaviness, doubt, anxiety, and I felt more peace. God does work in desolation. It’s not always the mountain top consolations where we discover God’s will.” said McGrattan. In retrospect, he attributes much of his initial formation to his father. McGrattan was inspired by the way he lived his life, his work, and his commitment to family and faith. Terrence McGrattan’s outlook on life was shaped by the death of both of his parents at age six, leaving him in the care of his elder sister. He held fast to his faith, and raised his two children to know, love and serve God. He allowed room for choice, but in the McGrattan household, Sunday Mass was non-negotiable. His father sat in the same spot behind the pillar at church so he couldn’t see the priest. They would come home after Mass, eat breakfast and discuss the priest’s homily at length, interweaving politics and social issues. It was in these discussions that McGrattan grappled with questions about the faith in such a way, he didn’t feel the need to question his faith later in life. Besides his parents, who have since passed away, there are other key relationships that have shaped and supported him. 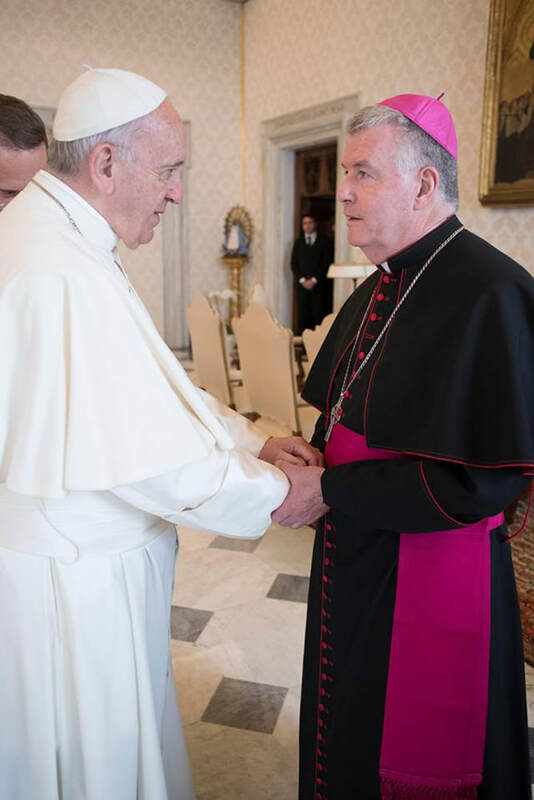 While Bishop William McGrattan is known as His Excellency today, his close friends simply call him Bill. He speaks affectionately about his only sibling Theresa, a year and a half his junior. She came through town for a weekend in March. Both huge hockey fans, they cheered on the Calgary Flames and enjoyed the company of mutual friends at a dinner party. In fact, she is still dear friends with one of McGrattan’s former girlfriends, with whom he was in a serious relationship for five years during high school and university. “I would always raise the issue of having children. I jokingly said to my girlfriends that I’d really like to have a hockey team – six kids. My sister said that was the death nell in the relationship,” he laughed. McGrattan’s buddy Francis McKee is one of those close friendships. They were high school tennis partners and university chemical engineering classmates. As 15-year-olds, they tossed around the age old question: what do you want to be when you grow up? McGrattan has no recollection of telling his friend he wanted to be a priest, but that conversation remains a vivid memory for McKee, now Fr. 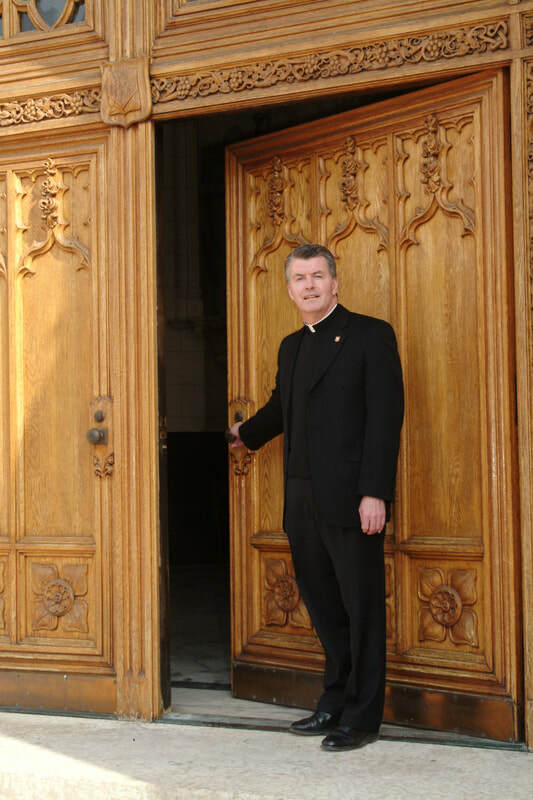 McKee, serving in the Archdiocese of Montreal. They still get together every summer. “When we get together we both say that even though the years have gone by it’s almost like you pick up where you left off. I’ve found that with a few priests in the London Diocese as well,” said McGrattan. Bishop McGrattan with his sister, Theresa. Bishop McGrattan with Andy Sarkany. 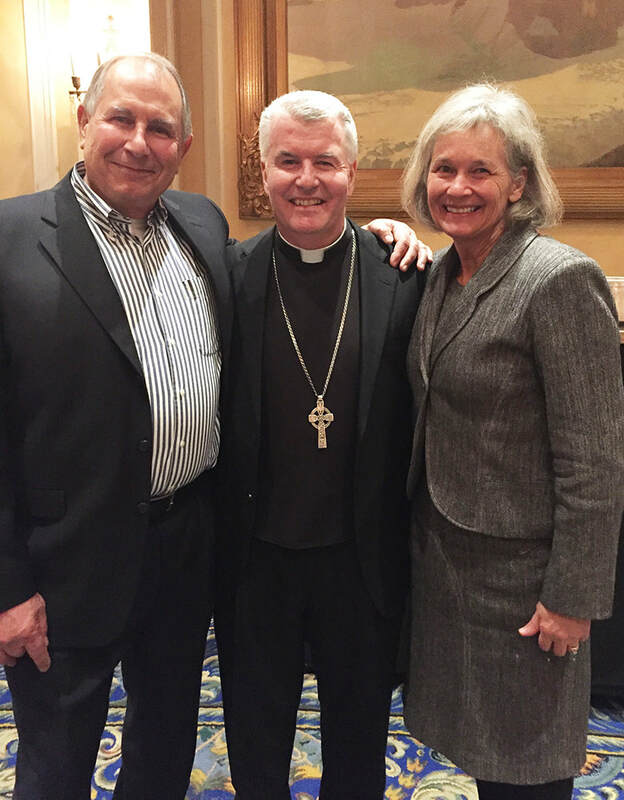 Bishop McGrattan with Andy and wife, Brenda. One friend from university is so close, they call themselves brothers. 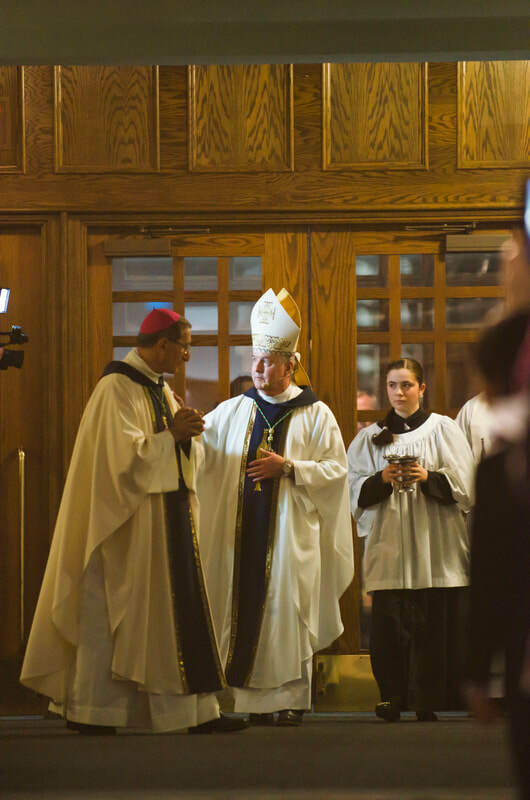 Like a true sibling, Andrew Sarkany wasn’t afraid to vociferously challenge McGrattan all the way through the seminary until he was ordained 30 years ago, on May 2, 1987. McGrattan only spent three years in parish ministry in Chatham Ontario, before traveling to Rome to complete a two year masters degree in fundamental moral theology at the Pontifical Gregorian University. Upon return, he served as an associate professor on faculty at St. Peter’s Seminary for five years and as rector for another 12 before being appointed bishop. McGrattan emailed Sarkany early morning the day his first appointment as bishop would go public. He got a surprise visit that same morning at the seminary chapel from his old friend who had cancelled all his dental client appointments to come see him. “Is this what you want?” asked Sarkany. 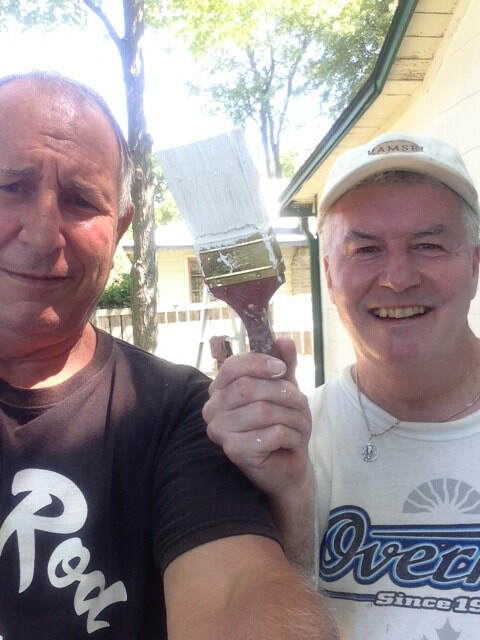 “I said, ‘Andy, it’s what the Holy Father wants, and it’s what I am called to do.’ He said, ‘I just wanted to come over and see my brother to make sure.’” Then he went back to work. But it should come as no surprise that the most important relationship he maintains is the one he has with the Lord. He established a disciplined prayer life during his time at the seminary. His prayer time includes the Breviary, daily Scripture readings of the day, giving thanks, offering petitions from the previous day, doing an Ignatian examen of conscience, and quieting his mind to listen to the Holy Spirit. Most importantly for McGrattan, it’s encountering Christ in the Eucharist, just like he did attending daily Mass as a school boy. Visiting the Salt & Light studio in Toronto during an interview with Deacon Pedro. This is the life of the ordained priest. Obedience to where God calls entails a life of new adventures. “Picking up and going, after having established relationships, is a sacrifice. Close friends and family have accepted that this is part of my life and they actively don’t question it, they just support it. I have a sister like that,” said McGrattan. He was appointed Auxiliary Bishop of Toronto eight years ago, and then four and a half years in, he was reassigned as Bishop of Peterborough. Almost three years later, he received another call. The Nuncio, Most Rev. Luigi Bonazzi asked McGrattan to arrange his schedule to meet him at his Ottawa residence in three days’ time. He didn’t explain why. The Nuncio is an ambassador. 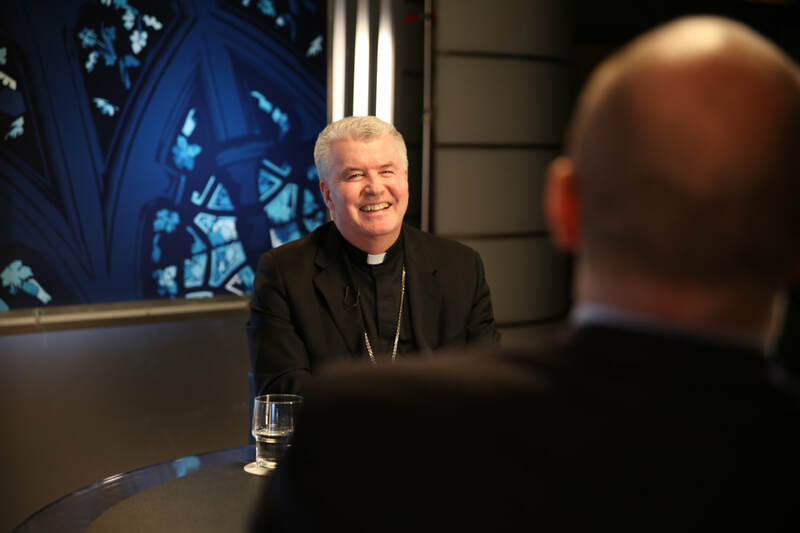 The Holy See appoints a bishop to Canada to establish good diplomatic relationships with the Vatican and to advise the Pope about priests who would be good candidates for bishops in Canada. Bonazzi greeted McGrattan very warmly and gave him a letter from Pope Francis to read in the chapel. He said he’d return in 15 minutes. McGrattan opened the letter. It said the Pope had accepted Bishop Fred Henry’s resignation because of health reasons and was appointing McGrattan in his stead. “I think priests and bishops draw strength from just being able to say yes. It sounds scary to certain people when we invest so much energy and value in our freedom, to say we’re going to let it go." McGrattan compared freedom to that of opening and closing a door. The fullness of our freedom can only be reached by opening the door to new possibilities, but at the same time knowing that we are closing it to other ones. “There’s a deep peace when I look back and say I didn’t necessarily choose my path. I am able to say with humility and confidence that this yes was Your will and not mine. Ad Limina visit at the Vatican with Pope Francis in 2017.